Big Buck’s may be sidelined by injury, but racing has a worthy new champion staying hurdler in Solwhit, who added today’s John Smith’s Liverpool Hurdle to his victory in the Cheltenham Festival’s Ladbrokes World Hurdle. 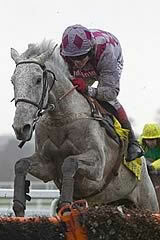 Ridden by Paul Carberry, Solwhit scored easily by three lengths and a length and a quarter from Holywell and Smad Place. It was a show of such superiority it seems a pity the winner did not step up to three miles sooner to give Big Buck’s some serious competition, although injury has curtailed his career and it is a credit to trainer Charles Byrnes that he now has him fully fit again. Besides, when it comes to showdowns involving Solwhit a very significant one looms, for he is likely to clash at Punchestown with the outstanding mare Quevega. Byrnes said of today’s race: “That was fantastic – he’s such a brilliant jumper you would hardly know he’s left the ground. “The problem with taking him to Punchestown next is that the gap is quite small, but he’s done it easily today. 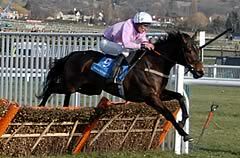 The only race he’s entered in there is over three miles [he has won the two-mile Champion Hurdle in the past] where he would meet Quevega. That would be some clash, but he’s been in plenty of those. We’ll see how he is before making a firm decision, but if he’s okay he’ll probably go there. “Solwhit was absolutely brilliant today,” said Carberry. “I knew Ruby was in front and I knew he would be slowing it down to look after himself but I travelled great the whole way. “He jumped absolutely brilliant. He was real long at a few but it doesn’t feel like that when you are on him. I was long at the last but I knew he would come up and clear it because he was travelling so well. 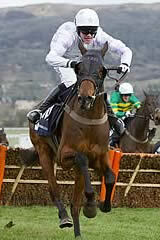 “He was twice the horse today that he was in Cheltenham and he was brilliant. He jumped great and just kept cruising through them like a knife through butter. Trainer Alan King was very pleased with Smad Place following his run in the Grade One John Smith’s Liverpool Hurdle where he was beaten into third place by Solwhit. The grey travelled superbly well and looked like he could win heading to the last flight but Solwhit always had the six-year-old covered. “He’s run very well and we’re pleased with him,” said King. “He looked like the winner at one point until this thing (Solwhit) appeared out of nowhere like he’d just joined in! That’s him done for the season now – he won’t go to Punchestown as he’s not entered. Jonjo O’Neill was delighted with Holywell’s run after son of Gold Well took the step up in grade in his stride when finishing the three length runner-up to Solwhit in the Grade One John Smith’s Liverpool Hurdle. The six-year-old was last seen when successful in the Pertemps Final at the Cheltenham Festival but his future surely lies in graded races following this performance. “It was a great run. Although the winner won easily, it was probably not a great race as a few of them ran below par,” said O’Neill. “If the ground is soft he’ll go to Punchestown (for the Grade One Ladbrokes.com World Series Hurdle on April 25) although unfortunately Solwhit could as well.